This post is of interest to ham radio operators, and also anyone who wishes to monitor NOAA weather radio, police, fire, EMS, aircraft, marine, and other radio traffic using a $15 receiver plugged into your laptop. 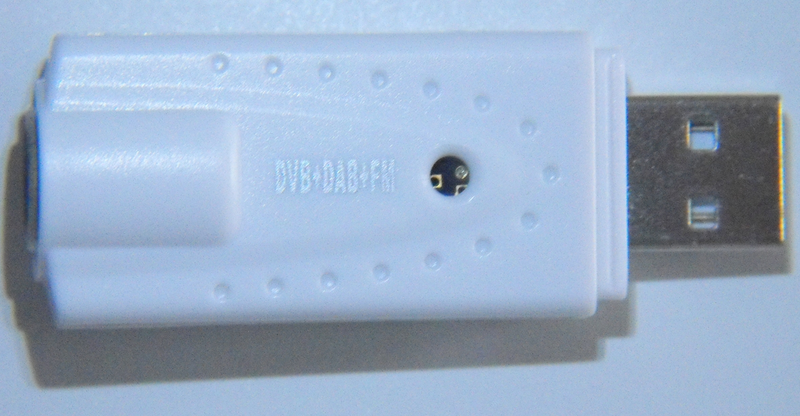 The Chinese USB "dongles", originally intended to receive the Far East mobile television service, are being re-purposed as VHF/UHF receivers for many different modulation schemes and protocols. The software to re-purpose them runs either on a PC (Win/Mac/Linux), or on a single-board computer like a Raspberry PI (Raspian Linux). At about US$15, Ol' Backwoods just had to have one. The RTL-SDR receives on 50 - 2200 MHz. It is possible to receive HF; more on that in a bit. Order your RTL SDR dongle from eBay or Amazon. Then, use the instructions here to help you download the SDRsharp software; I used it on Windows 7. The RTL-SDR can receive HF through the use of an upconverter you can buy on Amazon. There is also a special direct-sampling RTL-SDR dongle available from Easy-Kits that receives 120kHz-54MHz, with an internal preamp to help sensitivity at HF. It also works with the SDRsharp software described below. At US$75, it's a bit pricey, but no more than the VHF/UHF RTL-SDR with an upconverter. I understand the regular RTL-SDR can also do direct sampling to receive HF, but without an external preamp, the sensitivity is not good enough to receive shortwave signals. Ol' Backwoods wants to use an HF-capable RTL-SDR to be able to capture PSK31 conversations from a dipole antenna at home, and push them through to my iPhone, even when I am not in front of the rig. The mag-mount antenna provided with the dongle is a joke for anything below about 800 MHz. I cut the coax, saved the connector end, soldered on a dipole made of 20GA hookup wire, cut to the NOAA weather band, and hung it vertically from my upstairs ceiling. The connector on the dongle is an MCX female, and adapters are available to other connector types; I just didn't have one on hand, and I wanted to get running quickly. If you don't have an antenna, I might suggest this inexpensive scanner antenna for reception at home. You don't even have to have it outside; I have a similar one in my attic. Or, you can construct a dipole or ground-plane antenna out of hookup wire, like I did, but that won't be very wideband. As the instructions for zadig and SDRsharp suggest, I first tried receiving wideband FM from a local FM radio station. I was able to get that working within a minute of downloading the SDRsharp install. The frequency adjustment is a little squirrelly; each digit has a "virtual" up and down button overlaid on it it. Click near the top of each digit to increment each digit, and near the bottom to decrement. There probably is a way to type in a frequency directly, but I couldn't find it. The default RF gain is 0 dB. That will work for nothing but super-strong FM broadcast stations. Our local NOAA weather radio station, which booms in here 60 dB over S9 on my ham receiver, was not received AT ALL by the SDR, with my hanging dipole. In the US, tuning to NOAA weather radio is a good way to start getting the RTL-SDR to receive narrowband FM signals, as the stations transmit continuously, and they're easy to find. It's always one of these frequencies: 162.400 162.425 162.450 162.475 162.500 162.525 162.550. When I clicked the "Configure" button and increased the gain to about 20 dB, I saw the NOAA station at 162.450 MHz pop up in the center, and then when I clicked on the signal, it began demodulating. I increased the RF gain to bring up the NOAA signal to 0 dBFS, as indicated on the spectrum display. The filter bandwidth was set way too wide, and it was bringing in a lot of noise on the audio. I had to cut the filter bandwidth to 8000 Hz (as shown in screenshot below), and increase the filter order to 400 to steepen the skirts of the filter, to get the audio sounding right. My settings on SDRsharp for Windows are shown in the screenshot below, to receive our local NOAA weather radio station. Notice the dongle's notion of frequency is wrong; it displays a frequency 7 kHz too low. There is a means to correct that, but I didn't fool with it. Next, I want to get this working on a Raspberry PI, pipe in a decoder, and a GPS, and WiFi or Bluetooth, so I can get automated indication on my iPhone that there is a severe weather warning, no matter where I am on the road. Decode P25 (land mobile radio Project 25), which is used by many police/fire/EMS orgs. A plugin to receive trunked P25 (where the frequency is hopped occasionally). Lots of discussion at the Radio Reference thread here. Receiving digital shortwave transmissions (upconverter required) in Digital Radio Mondiale (DRM) format. Monitoring Automatic Position Reporting System (APRS) (ham radio). Here's another method. Receiving D-STAR voice (ham radio VHF, UHF). 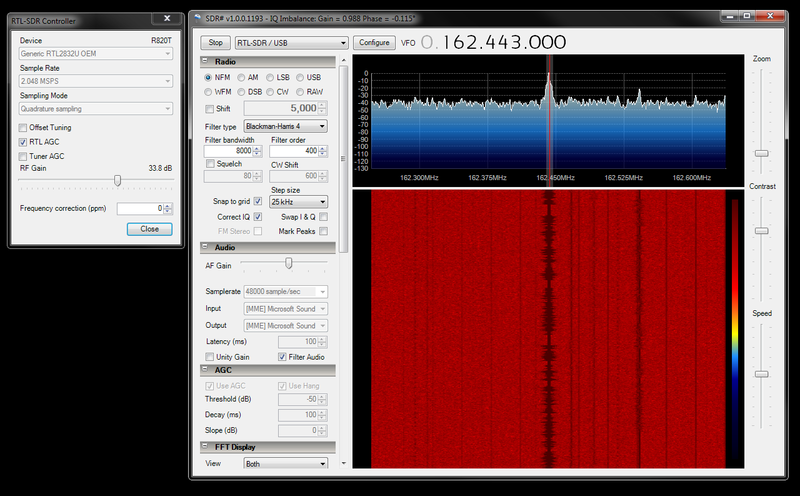 With a cheap satellite dish antenna, you can receive echoes from the moon with an RTL-SDR, from a station in Germany! By any chance have you tried receiving the HF bands (6-160) using the Ham It Up v1.2 - NooElec RF Upconverter available on Amazon.com? Do you have it working? Can't we get this fm transmitter with antenna?